We are just checking the page proofs for our book Code/Space that is nearing publication after a somewhat slow production process through much of this year. The book has an ISBN and is now listed on the MIT Press website, although we are waiting to see what cover design is going to be applied. The RRP of £25.95 for Code/Space seems quite responsible, especially as Routledge is charging £85 for Rethinking Maps. 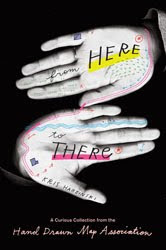 I recently reviewed a copy of From Here to There: A Curious Collection from the Hand Drawn Map Association, by Kris Harzinski (Princeton Architectural Press, 2010) for the journal Cartographica. "Overall, this volume fails to deliver an insightful intellectual understanding of the practices and meanings of hand-drawn mapping. It also fails as a coffee-table book, because the visuals and production design are not good enough. It is not even quirky enough to be the 'curious collection' claimed in the subtitle. There is clearly scope to do better with this topic!" You can read the whole of my review here.